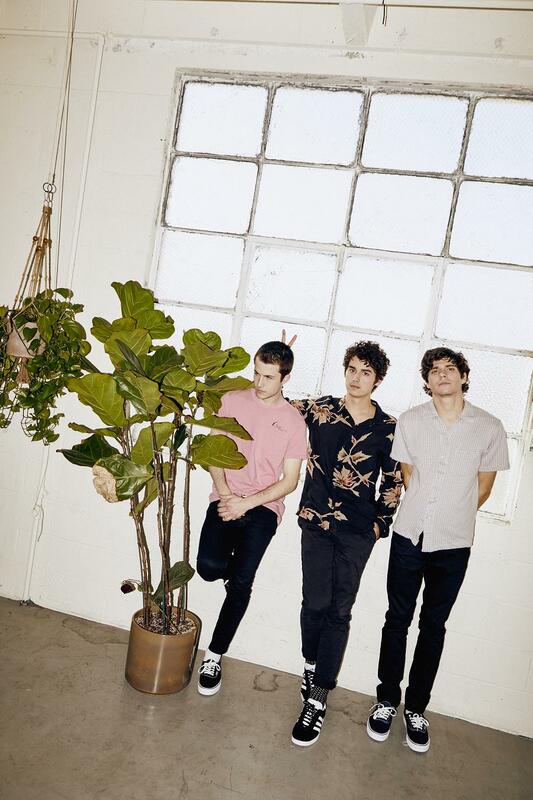 If the rise of Wallows has seemed pretty stress-free then that’s largely because, well, it pretty much has been. The Los Angeles based three-piece are chatting to Clash from a coffee shop above a recording studio in West London, and they’re in town to play two – long since sold out – headline shows. Their first in this country, the shows cap an astonishing 12 months which include debut single ‘Pleaser’ going viral and follow on EP ‘Spring’ becoming a smash. “It has been really crazy for us,” Dylan Minnette admits. “It’s funny, one year ago today we put out our first single. Now it’s a year later and we are visiting a place we have always wanted to come to”. A well-connected bunch – Dylan is a respected actor, who took a lead role in acclaimed US drama series 13 Reasons Why – Wallows’ profile shouldn’t obscure their songwriting; after all, that’s what keeps fans coming back long after the celebrity buzz has subsided. Effervescent indie pop with a tropical edge, reference points include everything from Vampire Weekend to SZA. There’s certainly a breadth to their debut EP. ‘Spring’ ranges from the crunch of opener ‘Ground’ to the sheer Californian zest of ‘Let The Sun In’ or the brooding psych-folk of ‘1980s Horror Film’. It’s remarkably assured, no doubt in part to the choice of the vastly experience John Congleton as producer. The material itself goes back some time; each band member added something new, often totally re-working old tracks to achieve something new, something Wallows. “All songs on the new EP were written at different times and over different experiences,” Dylan insists. “I think the oldest song on the EP is probably ‘Pictures Of Girls’ or perhaps ‘1980s Horror Film’, then the newest is ‘These Days’. Originally it was going to be a five song EP but then Cole (Preston, drums) made a demo and we were like, dude what we need to add that. We decided to do it and wrote it that night in the studio. The songs are kind of all over the place. It’s a cool balance of new and old”. Making a near-instant connection with fans, this relationship has already begun to filter on to the record. ‘1980s Horror Film’ for example, wasn’t due to appear on the EP, but the sheer popularity of its place in the live set pushed the band to think again.